As I write this I am also noticing that the two things that sum up the year for me are the two things that happen to be the unchallenged pillars of flavour. Coincidence? Moving on to fat, the woes of this misunderstood substance, especially animal fat, which in my opinion, is perhaps what makes meat appealing. And when you mix fats, it’s possibly the best thing you can do to a dish. Mind you, I am one to buy beef ribs and despite the flashing red sale sign hovering over family packs of tenderloin. Tilapia fillets…did I even touch those? I think I prefer my fish AFAP (as fat as possible) so keep that skin on and hand me that belly trim. Also, um, smoked oyster oil makes the kale nearly arbitrary. Yes, kale, the little black lace dress of the edible dimension in recent years. Now, to wrap things up, I’m really dishing up the nitty gritty essence of the year in this one plate of a single carrot. Buried in coarse flakes of kosher salt and baked until the natural sugars become concentrated into a candy intensity, the flesh becomes tender yet firm and meaty, then finished with searing beef fat in the cast iron (which is, by the way, so 2014), this is the most tedious, pretentious, and worthwhile dirt cheap bite I’ve made. And with this South Asian wind sweeping across North America, briny notes from plain yoghurt and lentils sort of made sense. To make the baked carrots, preheat the oven to 425 degrees F, with the rack placed in the middle. Pour half of the salt into a baking dish. Nestle the carrots into the salt and pour the remaining salt on top of the carrots to cover. Bake the carrots for 40-45 minutes or until tender when pierced by the tip of a knife. Let stand for 10 minutes, before breaking off the salt cap and brushing off the excess salt. Heat the beef fat in a cast iron skillet until hot. Add the carrots and sear on all sides until golden and lightly blistered. To make the briny lentils, combine all ingredients except for the yoghurt and arugula and let stand for at least 30 minutes, or preferably overnight in the fridge. To serve, divide the lentils into four plates. 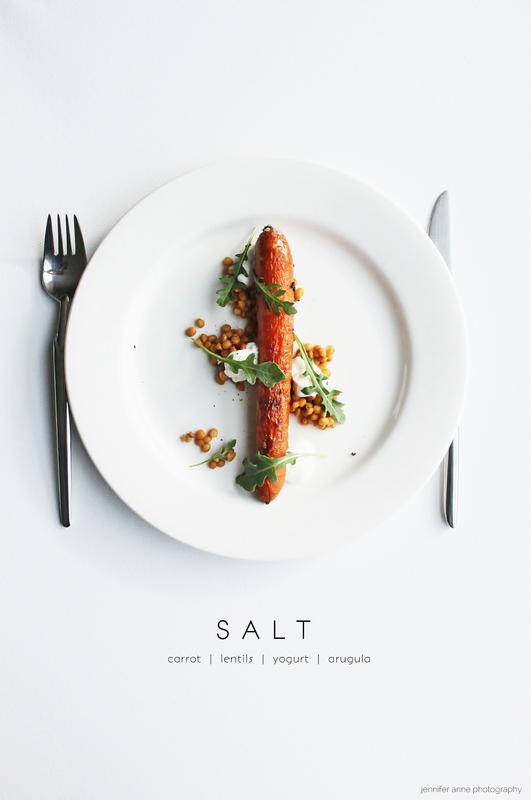 Place a carrot on each plate, dot with yoghurt, and garnish with arugula.